George Romero has given us some of the best, if not the best films in the zombie genre. Hell, he invented the genre. He has given us “Night of the Living Dead” , “Dawn of the Dead” (my personal favorite), and ” Day of the Dead”. Some twenty years later the man returned to the zombie genre and gave us “Land of the Dead” which was good on its best day. Then he gave us the Blair Witch/Cloverfield inspired “Diary of the Dead” which I thought was fantastic. A true return to his political and class statements on society as he did with the earlier films of his career. Now with “Survival of the Dead” we get a new look into the world of Romero’s zombie universe. Now I have been hearing quite a bit about this while it was being made, and sadly it did not get a theatrical release but maybe a handful of theatres across the states. But non the less I was looking forward to seeing it. If anything, Romero still finds the most creative and brutal ways to kill zombies so I would most likely get lucky and have a few cool blood spattered death scenes. From most of the reviews of this I have read, it seems that most people down right hate this latest installment and they feel that Romero has lost it as a filmmaker and they wonder if he ever even had it. I whole heartedly disagree. I think his latest film “Survival of the Dead” is quite good. 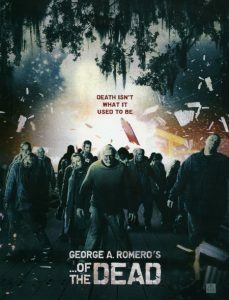 Not his best, but still quite good and a great addition to the evolution of the zombie franchise. This film takes place a little while after “Diary of the Dead” took place and takes one of the smaller characters from that movie, in this case military personnel, and follows their journey through the world zombie infested lands. Meanwhile, there is an island not too far from the New England coast where people live with very few flesh eaters still roaming around. On this island are two families that have lived on this island for quite sometime, even before the zombie outbreak. It sort of plays out like a Romeo and Juliet type of scenario where these two prosperous families hate each other for their disagreements on what to do with the zombies. One side wants to completely eradicate and kill every zombie whereas the other side wants to use the zombies for chores and slaves and keep them around and see if they can find a cure or to see if they can get the zombies to start eating animals instead of humans. Personally, I think that is a pretty good story line set up and that it takes the “Dead” franchise into another evolution of what might happen if faced with these circumstances. So the leader of the family that wants to eradicate all zombies is exiled to the mainland and a few of his cronies follow him there. This is where the military personnel meet with him and they both decide to hitch a ride back to the island now packed with soldiers and weapons to gain control back of the island. As you may be wondering, more zombies attack when let loose and quite a few deaths ensue, but not only from zombie attacks but from stubborn humans killing other humans which is a sad tale but also a true one. As this film ends we are left with quite an amazing picture as to what is in store next for the evolution of zombies and how the rest of the human population will deal with it. The death scenes are a plenty with some great gore effects. Sadly, Romero has not hired Tom Savini to do actual makeup for most of the gore, instead we get CGI gore which I hate, because it always looks ridiculous and stupid. But, when people get ripped apart and their guts spill, it is all real make up and gore which put a smile on my face. In all i thought this was a solid add to the franchise and look forward to whatever sequels Romero tends to make and to see his social commentary on society put into his work. Kudos to you Romero. In addition, you will get an AWESOME intro to the movie by Romero himself with zombies in the background working on the movie set and destroying things and when the zombies destroy things and interrupts Romero, he gets his sweet sweet revenge. It is really funny. The Ultimate Zombie Movie Guide!!! In Honor of Zombie Jesus Day!!! This entry was posted on Tuesday, August 31st, 2010 at 1:17 pm	and is filed under Film. You can follow any responses to this entry through the RSS 2.0 feed. You can leave a response, or trackback from your own site.